HomeBlogA checkup at age one? A checkup at age one? The short answer is “First visit by first birthday.” That is the view of the American Academy of Pediatric Dentistry and pediatricians agree. The American Academy of Pediatrics recommends that children visit a pediatric dentist by age 1. The idea of such early dental visits is surprising to many new parents. Why should an infant see a dentist when he/she has so few teeth? Unfortunately, national studies have shown that cavities are increasing in preschool-aged children. More than 1 in 4 children in the United States has developed at least one cavity by the age of 4. Dental caries (cavities) remains the single most common chronic disease of childhood – five times more common than asthma and seven times more common than hay fever. 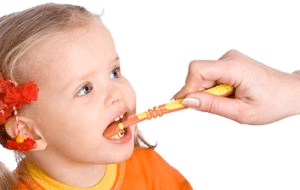 Waiting until age 3 or later for the first visit is no longer sufficient to prevent dental disease. Even if your child is older, it is never too late for their first visit. In fact, older children will often participate and learn from the first visit in ways that our youngest patients are unable to. Your child’s first visit to the dentist, regardless of age, is an opportunity to begin a journey toward a lifetime of oral health. Read more about how you should prepare for your child’s first visit here.